Or relying on weak clips that still drop your diaper investment down the toilet? 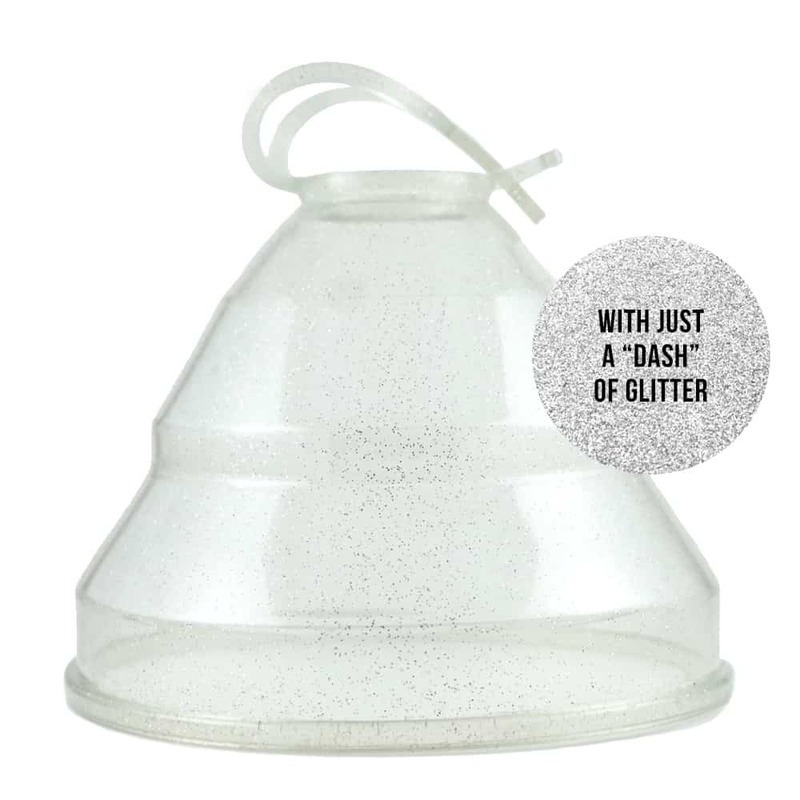 Have you become a world-class juggler between using your sprayer and a huge shield? Take confidence in knowing our sprayer partner (industry experts in a healthy home experience) is backed by no other than Shark Tank investor and entrepreneur Mark Cuban. 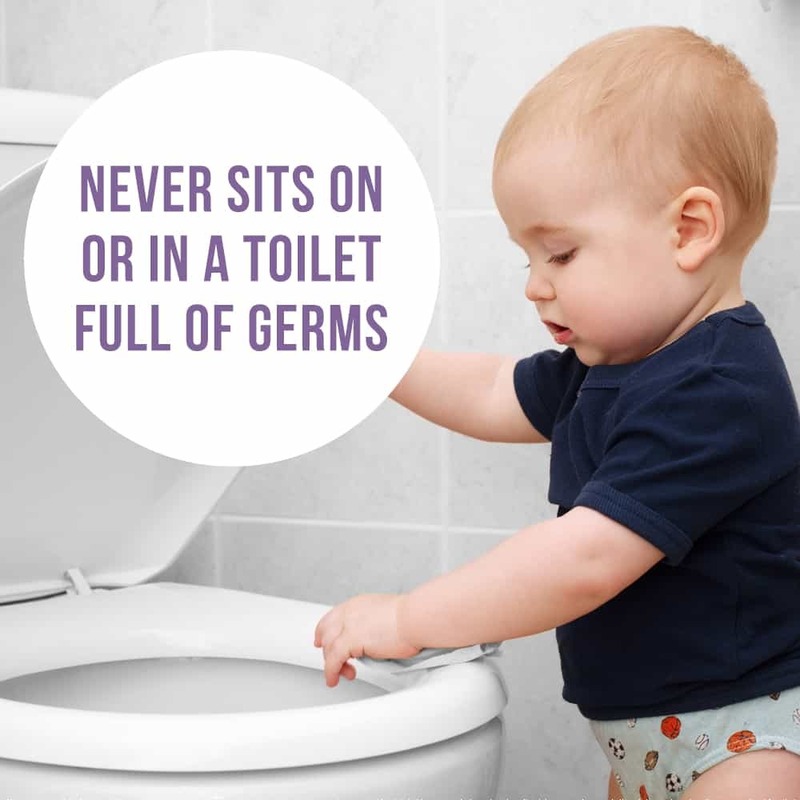 Cloth diapers don’t have to be a chore – spend those extra minutes sleeping rather than scrubbing poop off your walls! 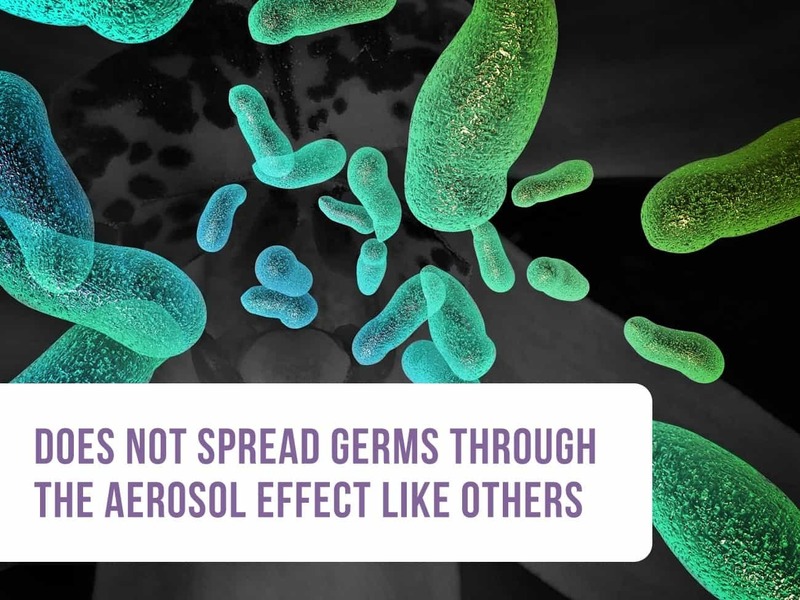 Typical diaper sprayers agitate toilet water containing INTESTINAL BACTERIA like Shigellosis, staphylococcus, salmonella, klebsiella, and e.coli – that same sprayer agitation also makes toilet bacteria airborne…you’ve probably felt this light “mist” while spraying. 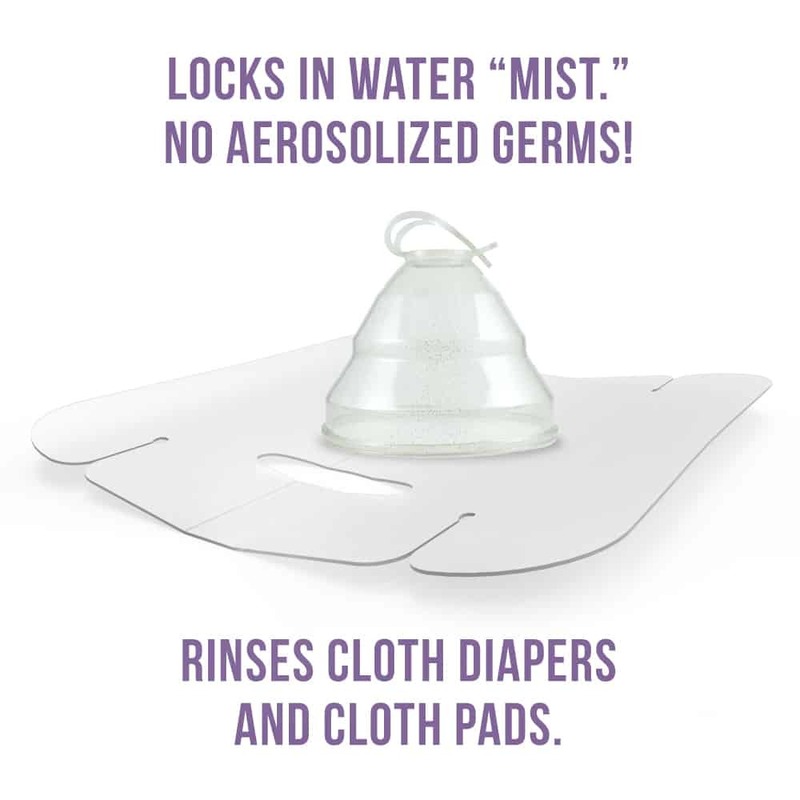 This biohazardous vapor rises out of open-ended shields and lands back on your door knobs, faucets, toothbrush, and onto your baby. 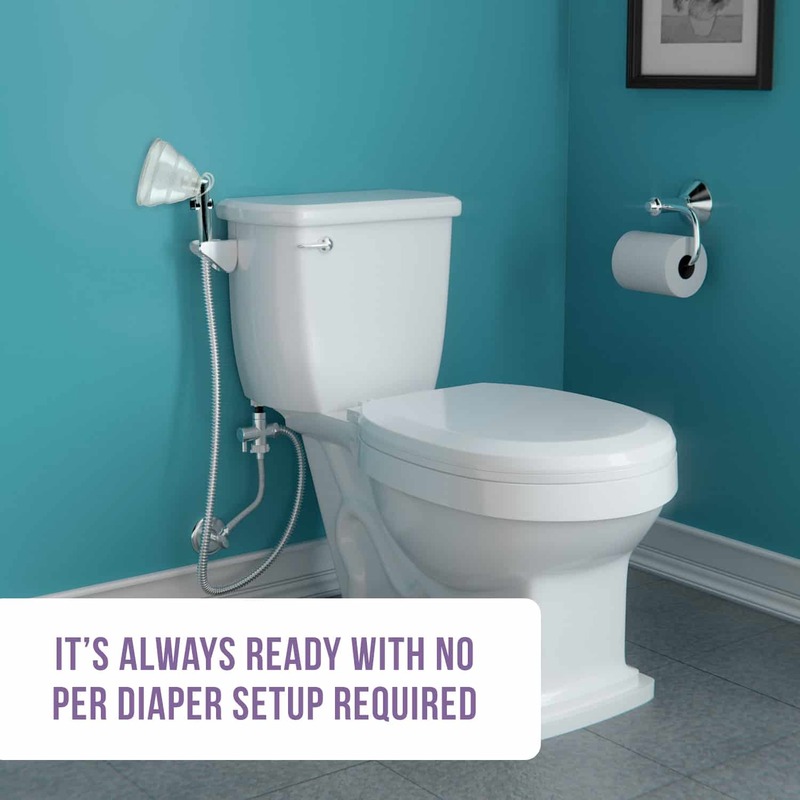 The cloth diaper sprayer installs in 3 easy steps on any standard toilet (with a flexible toilet line) for precision cloth diaper cleaning. Comfortably spray with a 4-foot premium metal hose enclosing a woven internal core for double protection against flooding. A heavy-duty, solid brass water diverter valve allows you to adjust the pressure and shut off the water so that you always remain in control. 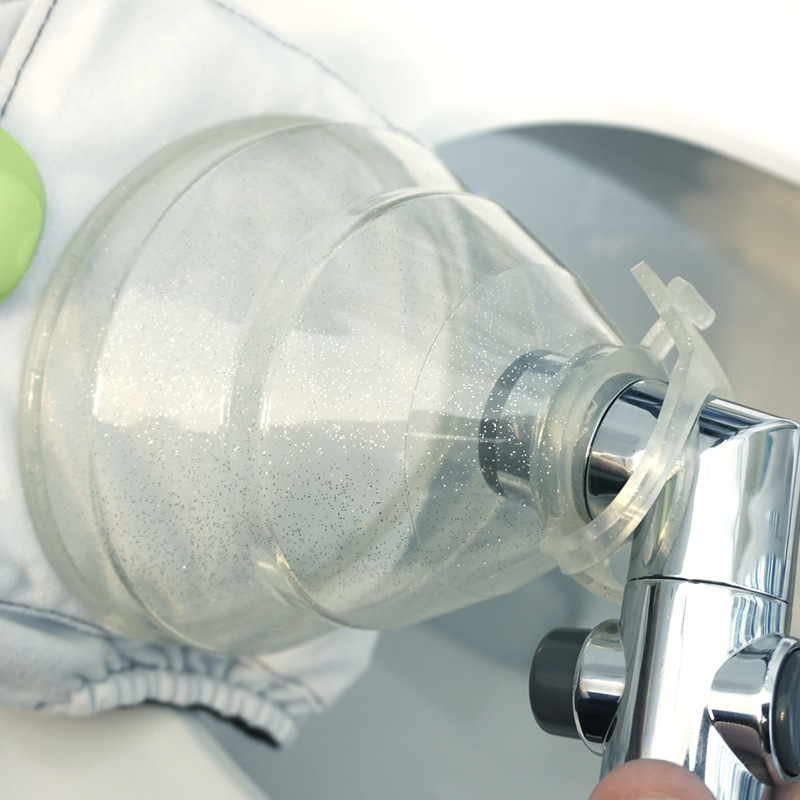 Never fuss about bathroom space again with our patented shield that fits in the palm of your hand and folds down – no need to assemble it or even lift the toilet seat up to use it. 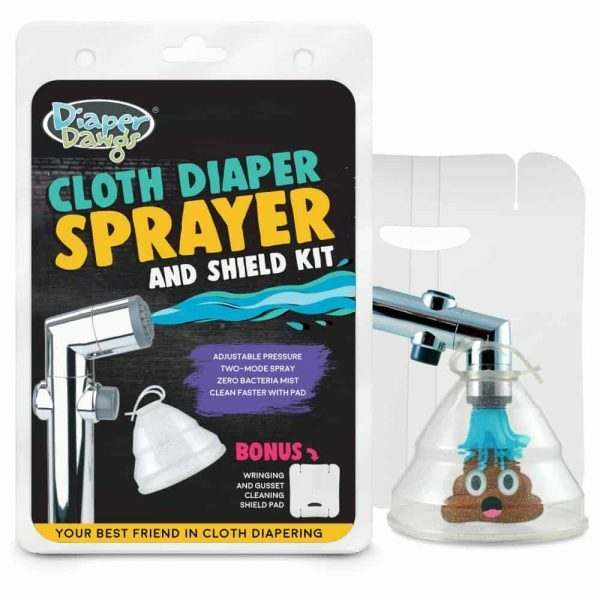 Choosing the right type of cloth diapers was frustrating enough, choosing the right diaper sprayer system shouldn’t have to be. Try everyone else out, then see why others call us “seriously amazing.” Diaper Dawgs is making cloth diapering more sanitary with less hassle. Will you join us? IMPORTANT: After each use, TURN OFF the T-Valve located at the pipe fitting to close the water supply to the sprayer head. 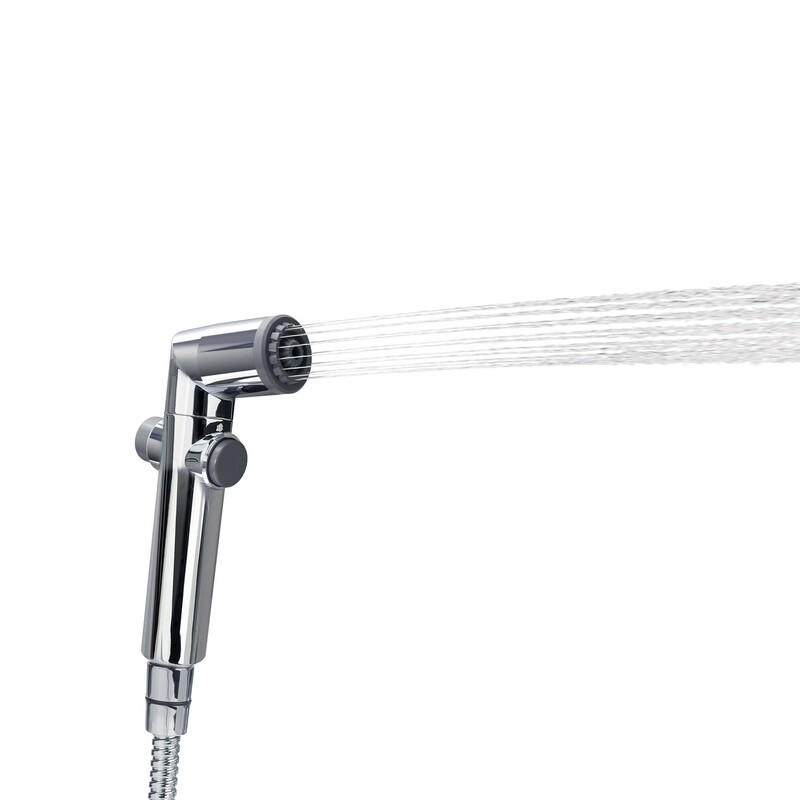 Failure to turn off after each use may weaken hose and sprayer head or cause flooding. 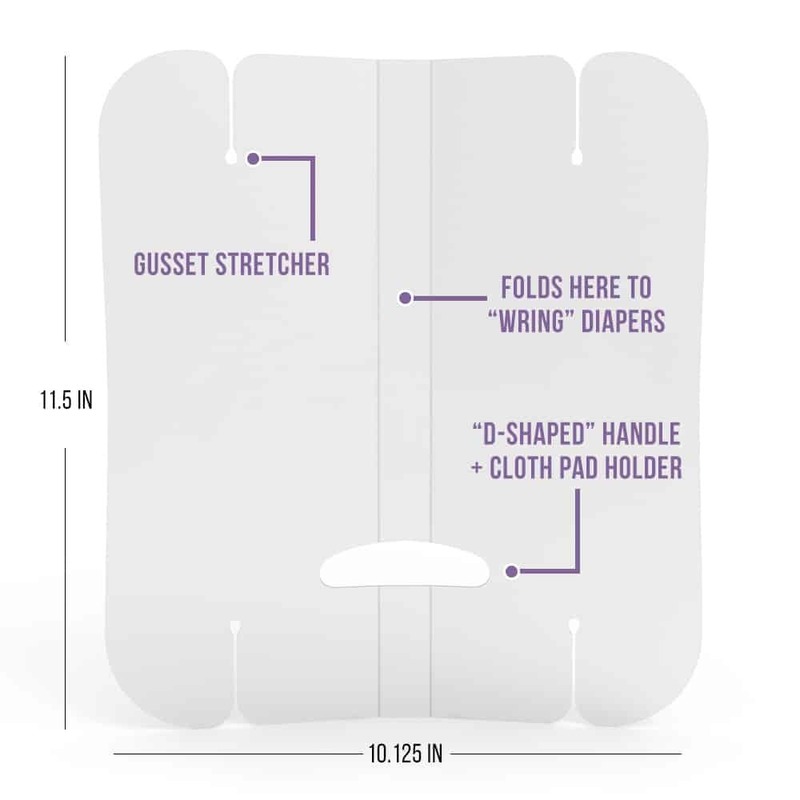 Neither the Manufacturer nor Diaper Dawgs is responsible for damage caused by the failure to follow this recommendation. Toilet must have a flexible water supply line. 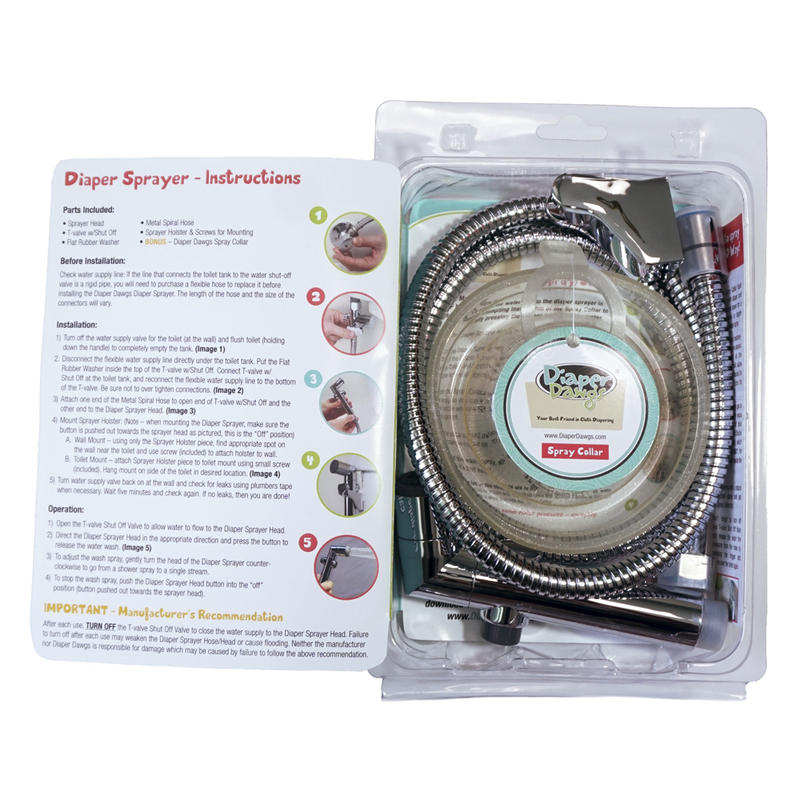 The Diaper Dawgs Diaper Sprayer comes with a limited 1-year warranty serviced by Brondell, Inc. Please contact Brondell for issues specifically regarding the Diaper Sprayer. For Diaper Sprayer customer service or support, please call toll-free at 1-888-542-3355 or email support@brondell.com. 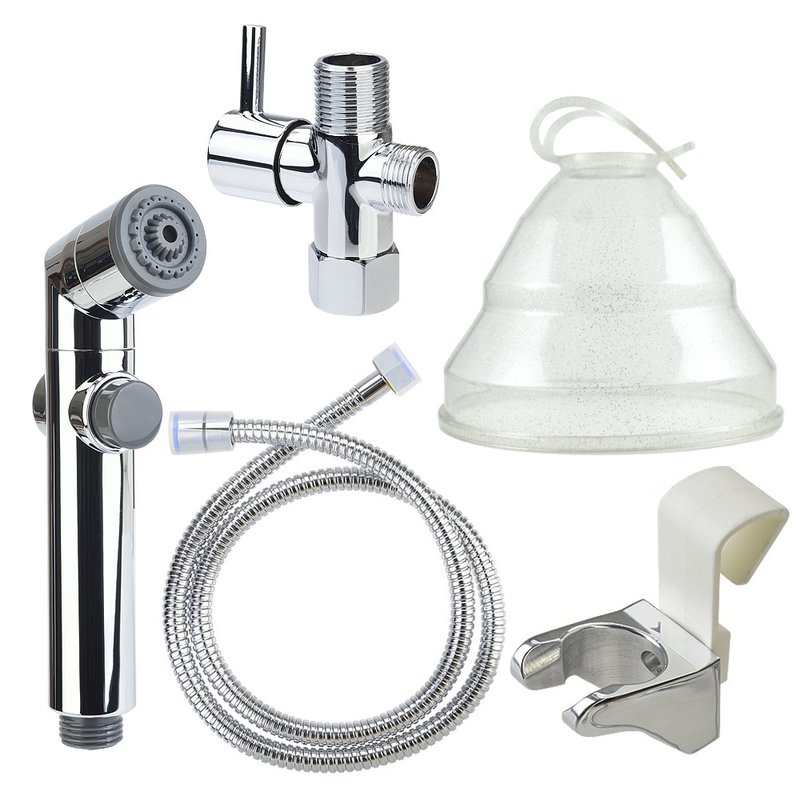 Brondell, Inc. is an innovative leader and developer of quality, eco-friendly bathroom products and is backed by pioneering entrepreneur Mark Cuban.